Having decluttered my clothes and basked in the glory of my newly tidied wardrobes and drawers, I was keen to tackle the next category in the Konmari Method: Books. I grew up in a house filled with books. My dad owned a vast number and always had several on the go at once. Without fail, come 4pm – afternoon tea time – he would settle down with a cup of coffee and a couple of biscuits, remove the fringed leather bookmark, purchased at a National Trust property, from one of the books in the small pile by the sofa and indulge in some designated reading time. Frequent trips to bookshops and the local library were a feature of my childhood and I would read every night before bed. I grew up with the mentality that you read a book and then it was added to the collection on your shelves, becoming part of the tapestry of your life, a tapestry that said “I read this, this is me”. Nothing seems to declare to the world what sort of person you are like your book collection. It speaks of your likes and dislikes but more than that, we equate a person’s choice in literature with their intelligence and core personality traits. When we moved into our flat and it became apparent that my housemate had so many books that some would have to sit behind others on the book shelves, it was a natural move to display the most impressive ones at the front – the classics, the ones by highly regarded authors, good quality contemporary fiction, and any with the words “Shortlisted for the Man Booker prize” printed on the front cover. While less impressive offerings – trashier scifi, the odd piece of chic-lit – were shuffled to the back, out of sight. We wanted the world (ie any visitors to our flat) to know that we were the sort of people who read Good Books. Books have been the one category that a lot of my friends have said they just couldn’t part with and Kondo echoes this saying she has found that people often find it incredibly hard to declutter their books. We seem to feel particularly attached to books – possibly because, while we were reading them, we went on a journey with those characters. We lived through their trials and tribulations, we feel connected to them, invested in them. We spent quality time together, the book and I. Getting rid of it would almost be like getting rid of a friend. But, according to minimalists, these reasons for keeping books – as a display of one’s ego in literary form and an interwoven attachment to a physical object – are not good reasons at all. It is an axiom, part of the dominant ideology of how we live, that people keep books, display books, and lug these books around with them when they move house. These books help form part of a representation of self. And when an object is used to anchor our identity and project this identity to others, it can be very hard to get rid of it. To part with it is like we are erasing a little bit of ourselves. Who will we be without our possessions to mirror one’s self back at ourselves? But you don’t need to pin your sense of identity on material possessions. If you want to declutter your life, feel empowered to do so – you will still be interesting, engaging and knowledgeable (assuming you do possess these qualities!) without a large collection of books gathering dust on your shelves. You will still be the person who read all those books without having to prove it by continuing to own the physical copy. As for the feeling of sentimental attachment or nostalgia for the time spent with the book – whether it’s fiction or non fiction, the book led you, the reader, on a path through new information, ideas and discovery – but now it’s time for you to allow yourself to release the bonds you’ve created with these weighty piles of paper and printing. The purpose of a book, Kondo says, is to be read and to convey the information within it. Once it has been read its purpose has been fulfilled. The words within it contained meaning and when you read it, you absorbed that meaning. The act of reading that book has been experienced and thus the book’s work is now done – it has no additional meaning just sitting forever on your shelves. The first stage of decluttering books, just like clothes, is to get them all out and put them on the floor. This may seem like a lot of effort and heavy lifting when you are able to see them quite clearly on the shelves. But again, Kondo stresses that this is an essential move as it is only when they are removed from the shelves and awakened from their dormant state that we can properly tell if they bring joy. While on the bookshelves they remain part of the backdrop, part of the wallpaper, making it difficult to tell if the book itself truly deserves to stay. She warns not to start reading the books – the thrill it brings that indicates it deserves a place in your life should be evident from just holding it in your hands. Kondo includes her own book in her discarding policy and urges readers to get rid of it if it brings no joy. Despite a love of reading, my book collection was exceptionally small. Most of the books from my youth had been shed, like a snakeskin, along the way and in adulthood I hadn’t seemed to have amassed very many. My early to mid 20s had been spent clubbing and enjoying the various diversions London had to offer, activities that never seemed to leave much time for reading. And once I became a teacher, that took up all my time instead. It was one of the ironies of being an English teach that I never actually had time to read books. The only times in my adult life that I have done any concerted reading is when I’ve been travelling. Then it has been such a pleasure to luxuriate in a book – to have its reassuring weight on hand in my day sack whenever there was time to kill – waiting for a bus, waiting for a meal to arrive, that time spent resting in the hostel between the afternoon’s activities and going out for the evening, that time spent waiting for travelling companions to finish their washing or other chores before heading out to explore a new place, that time spent on long train rides in India feeling the breeze in my hair from the open windows in sleeper class, occasionally looking out through the metal bars at the passing landscape while I let the latest narrative developments sink in. These books had been transient – it is the very nature of books read when travelling to be passed on once they’re finished. At first I remember this felt a little jarring. It felt strange to immediately dispose of a book once it had been read rather than adding it to the mise en scene of my life – adding its physicality to my possessions, my identity, the things that made me “me”. But I quickly learnt to revel in the process – the time spent in traveller’s bookshops or perusing the book collections in hostels, browsing the well-thumbed volumes or swapping with other travellers. A book that I had finished reading, rather than becoming dead weight in my life, became a thing of worth, a thing of promise and potential. It became the currency with which to acquire something new and exciting. It was a good feeling to know that the book would go on to entertain another person and that in return I would also get a new book, a new adventure to fill the idle hours. I think this approach to books has stayed with me – it seems infinitely more rewarding to pass a book on so it can continue with its purpose to be read and enjoyed rather than carrying it with you forevermore and have it sit in a state of eternal stasis on your bookshelf. Despite all this, before I discovered minimalism, part of me had worried a little about what my diminutive collection of books said about me. Was it a failing on my part that I hadn’t nurtured a more impressive collection? As a grown woman, a teacher no less, shouldn’t I have a collection the calibre of which spoke of my passions, my wit, my intellect? Did my meagre collection make me look like someone who (gasp!) doesn’t really like to read?! For I know I have been guilty of judging such people. Oh, you don’t read books? Oh. Right. As I had so few books, it was no trouble for me to deal with them all in one go and it didn’t take long to sift them into two piles: The keepers and the discarders. The majority of the books in my discard pile were, interestingly, books I had not yet read. They were books collected along the way, most I wasn’t even sure of their origins. Somehow they had come into my life and I’d intended to read them but had never quite got round to it. Some of these unread books I had been carrying with me from house to house for 10 years or more! For some reason, whenever I was on the lookout for a new book to read, these unread books had never piqued my interest enough to be plucked from the shelves. A different book had always managed to wend its way into my hands instead. This is precisely the reason why these unread books should be discarded, Kondo says. You tell yourself you’ll definitely get round to reading them one day – but “one day” never comes. Timing is crucial: there’s a window of opportunity to read a book when it comes into your life and if you miss that opportunity the chances of the book being read after that are greatly diminished. Maybe they were books that you definitely intended to read when you got them, maybe they came highly recommended by others, maybe some were gifts – whatever your reasons for having them, their main purpose has actually been to teach you that you didn’t really need them after all. It’s time to let all these books go. And don’t feel guilty about the ones that were given to you as presents – acknowledge with gratitude the good intentions they were given with and let them be free. And the same applies to books that you only got half way through. It’s best not to kid yourself that one day you’ll pick it up and finish it. The purpose of these books was only ever to be read halfway. If you get rid of a book and you are suddenly gripped by a desire to read it, then just get another copy and this time actually read it, Kondo says. This thought offered a lot of comfort as I stacked up all the unread and half read books. If I ever really wanted to read any of these books with their unrequited literary offerings, I would easily be able to find another copy – after all, my school has a well-stocked library, there is a local library just round the corner from my house, all my friends have impressive book collections (and considering their eyes grow wide with fear when I mention my discarding endeavours, I doubt they’ll be decluttering those collections any time soon), there is a Waterstone’s five minutes away on the high street, I live walking distance from all the bookshops in the west end, and, of course, pretty much anything I could possibly want is a mere Amazon click away. I had nothing to fear from getting rid of these books. And I had much to gain as, rather than gazing upon them and feeling joy, I would gaze upon them and feel slightly guilty that my good intentions to read them had never come to fruition. Far better to be free of them and instead read books that have come into my life and grabbed me in the moment. And what about the books that you have already read? Think you might reread them some day? Think honestly about the number of books you reread – it’s probably not that many. Don’t hang onto a book that doesn’t truly inspire joy just because you think you might want to read it again sometime in the future. If it turns out you actually do, then just find another copy when the time comes. And anyway, the funny thing is that, sometimes, when you reread a book, its beguiling lustre seems to have dimmed a little. You remember ardently loving it at the time but second time round, having already trod that path, it doesn’t grab you in quite the same way. Of course, this doesn’t hold for all books – maybe there are some that you might love with a great passion and you find new ways to enjoy swimming in those words each time you read it. Those would be keepers. But apart from those few that inspire such joy, it’s best to let the rest go and fill any reading time with new books. With so many great books out there it seems a waste not to experience them – why cling to old books when you can go on new reading journeys and make new memories and connections? But before I said a final goodbye to my books, there was one subsection that I did reread: Books from my childhood. I still owned a small number of books that I had loved as a child – some of my old favourites that had managed to cling to me while others fell by the wayside. I intended to give these to my sister (as she had made me swear not to discard anything from our childhood without first checking with her) and if she didn’t want them, I would give them to the charity shop so other children may get some of the same enjoyment they gave me when I was young. 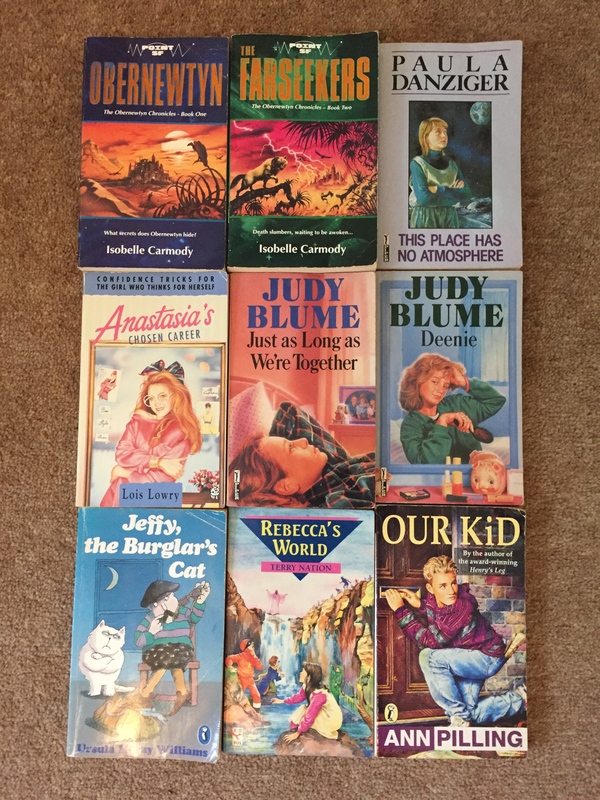 But before that, I plunged myself back into the past – into the world of Judy Blume, Paula Danziger, the Anastasia books and more. Being a teacher has taught me not to care too much about what others think (you’ve got to have a thick skin as a teacher otherwise you’ll spend far too much time doubting yourself and crying in the toilets) but despite this, I did feel a twinge of awkwardness to be pulling out a Judy Blume to read on the tube. And what did I find from rereading these much loved books from childhood? Well, I found they really are books for children! I didn’t particularly enjoy rereading them. Sure I enjoyed the nostalgia, the trip down memory lane but they didn’t grab me, I wasn’t excited and eager to pull them out of my bag whenever I had spare time. The purpose of these books was to be enjoyed when young and they had fulfilled that purpose admirably. Sometimes, when reading these books, I would get to the end of a chapter and go to turn down the corner of the page only to find a crease already there – sometime in the distant past, child me had also paused there. It was poignant to think of little me, with my unruly bushy hair, stopping at that point, folding the corner down and then turning off my bedside lamp as I lay under my pink duvet in the bed with its frame decorated with scratch and sniff stickers. Some of my old books from childhood. Here are two things I noticed from rereading these books – 1) I am now the age that the mothers in the books are (that weirded me out) and 2) a lot of the representations of the mothers were quite negative. They were pushy, demanding, emotional, vain and materialistic. The dads were represented in a much more positive way tending to be that sort of idealised father figure – kind, rational and comforting. I sort of wished I was at university and could write a dissertation on the representations of parents in books for teenagers from the 1980s and early 1990s. First stop for the books in the discard pile was school. What better place to start off-loading my joyless books than with the English Department, a bunch of certified book lovers! I had hoped they would eagerly fall upon my collection and engage in some sort of Hunger Games like behaviour to decide who got what but they seemed entirely uninspired by them (they were decent books, I swear!). The ones that remained after the English teachers had listlessly picked through them were given to the school library, who were having a fortuitously timed book sale, or I took them to the charity shop if they were unsuitable for the school book sale (eg “Quit Smoking Today” by Paul McKenna…although maybe I should have just handed that to some of the kids who smoke at the bus stop). I was pleased with some of the homes that my books found at school – a collection of reference dictionaries was taken by one of the English teachers for use in her classroom, a couple of books on art were eagerly received by the art department, and my old thesaurus was taken by a teacher who intended to have children in detention copy from it. He promised to frame this task positively by saying to the children that if they were going to spend time in detention they should use this time productively to improve their vocabulary. I would say that decluttering that thesaurus was actually one of the more emotional books to get rid of. I had been given it by my uncle for one of my teenage birthdays and I had loved looking through it and marvelling at the richness of language. It had helped me through my A-levels and my degree. But of course in this digital age it had become obsolete. thesaurus.com is now my writing companion, offering an unparalleled quantity of synonyms and such ease of hyperlinked cross referencing. It was sad to say goodbye to my trusty old thesaurus but I was glad it was going to a home where it had the potential to captivate other young people with its words – in my head, disaffected detention kids are now being inspired to turn their lives around thanks to the salvational properties of synonyms. And nobody is drawing penises in the margins. There was one particular book that was claimed by one of the English teachers which I was very relieved that I didn’t have to take to the charity shop. It was a book given to me by an ex-boyfriend and in the front of it he’d written an inscription. These were the sorts of words that a girl dreams will one day be written to her. It was a declaration of love and heartfelt intent – sweet, personal and touching. But the relationship hadn’t lasted and now these words served only to remind me of what it felt like to break someone’s heart. And I hadn’t even read the book. Maybe that was a sign that it was never going to work. But the thought that this book, with its attestation of undying love, would end up on the shelf of a charity shop had been too terribly sad to imagine. That it would sit there on that shelf, speaking those words to whoever happened to pick it up, to have them pause and wonder what had happened to the man who had written with such feeling and to the woman he wrote to, for them to wonder at the twists and turns of fate that had rendered those words a snapshot of sparkling hope and belief now seen through the streaked grime of recriminations and regret…for the book to end up there, well, to me that just seemed so sad. The shelves of charity shops must be an elephants’ grave yard for the tokens and keepsakes of failed relationships. So what was I left with once the discarding was complete? Currently I have 30 books. A few pertaining to my interests in minimalism, positive psychology, productivity and creativity, a couple relating to my hobby of swing dancing, a couple that I recently received and haven’t read yet but which are still in the window of opportunity whereby I’m eager to do so, and a little collection of books from my past. Just like with my clothes, I seem to have been drawn to keep one book from different stages in my life. So I have kept: The Ultimate Cat Book, a book about cat behaviour and breeds which I had loved when I was little, one book from my teenage years (a perennial favourite that I had still enjoyed upon rereading it), a book that I based one of my A-Level English Language coursework pieces on, a book called Representing Women that I’d read at uni and had fuelled my lasting interest in gender politics and media representations, and a little book containing a collection of postcards of the work of Christo and Jean Claude which I’d bought when I was living in New York and they had exhibited The Gates in Central Park. I also kept a book called Social Networks in Youth and Adolescence which had used a picture of me and my friends on the front cover. And I kept The Pocket Guide to Manwatching by Desmond Morris which I’ve only read half of but for some reason I really like it and it brings me joy. It certainly doesn’t bring my friends joy – it was one of the books I’d taken on my first backpacking trip and, as soon as we were through security, my travelling companions and I had eagerly rummaged through each other’s books to see what would be our entertainment in the coming months. Their faces fell when they saw The Pocket Guide to Manwatching. They couldn’t quite believe I’d used up one of our precious book allocations with a serious book about anthropology. I only read part of it after finding contemporary fiction more fun to read on the road, but I’d liked the book so much that I must have sent it home… unless I carried it with me the whole way round the world. I can’t actually remember but surely I wouldn’t have done that? But whether I carried it with me or paid the postage to send it home, clearly my love for that book was strong. And it still is – even though I’m not exactly sure why. I also kept a couple of glossy books about countries I’ve visited and all my Lonely Planets. The LPs definitely bring me joy. The adventures we’ve shared together! The things we’ve seen and done! They provided me with guidance, information and reassurance. The countless hours I’ve spent pouring over them – reading, learning, planning, tracing routes on maps with my finger, cross referencing different choices, excursions and journeys. They had told me where to go, what to see, where to sleep and what to eat. Of course I’d strayed from their recommendations many a time but they were always there when I needed them – my starting point, my rock. These were my religious texts. I view other guide books like the sacred texts of a different religion. The Rough Guide? Fine if you believe in that sort of thing but it’s not for me. The LPs are my holy books and I worship their scriptures of freedom and exploration. I nestled my slimline collection of books back onto the bookshelves. These were joined on the shelves by my laptop and headphone cases, as per Kondo’s recommendation to store as many things as possible vertically. I actually love being able to stow my laptop vertically on the shelf – I’d never even considered it before reading The Life Changing Magic of Tidying but it’s so much neater than keeping it out lying flat on a table. And considering how much I love my macbook it seems right and proper that it should have its own designated and venerated spot in the bookcase. Some minimalists suggest a Kindle as a great way to keep the physical clutter of books at bay. Now I love technology – from my laptop to my phone to my camera to my electric toothbrush – I don’t want something basic, I want something good. Yet I’ve never got on board with e-readers. I just prefer real books. I had worried about this little streak of Luddism – was my dislike of e-readers the starting point of a slippery slope to becoming the sort of person who jabs roughly and ineffectually at the screens of smartphones? So I breathed a sigh relief at research that justifies my preference for actual books with a whole raft of reading and comprehension benefits. Sure, the practicality of Kindles is a tough case to argue against but for now I’ll be sticking with real books. Just like with discarding my clothes, once the joyless books had been removed from my life, I felt a little bit lighter and freer. I do think books look nice in a room and it’s nice to peruse a friend’s bookcase and have conversation sparked by its contents. It’s also nice to borrow and share books with friends although this practice is receding as more people get Kindles. But all I know is that I’m glad I got rid of the books I no longer needed in my life. Whether they’d taken me on magical journeys and the characters had felt like friends or whether they’d made me feel kind of bad that I’d never got round to reading them, it was undeniably nice to set the books free. Their weight, physical and metaphorical, had left me. I wished them well and hoped others would get pleasure from the words between their covers. A lot of minimalist literature says that by adopting the lifestyle and jettisoning your unnecessary possessions, you actually create more time to read, read with more leisurely enjoyment, and absorb more information and meaning from each book – I look forward to seeing if this holds true.